Trades on day 1 of the 2018 Draft. AV analysis. Bill traded up to pick 7 to get QB Josh Allen. The Jets – Colts trade is one of the riskiest trades in recent history. 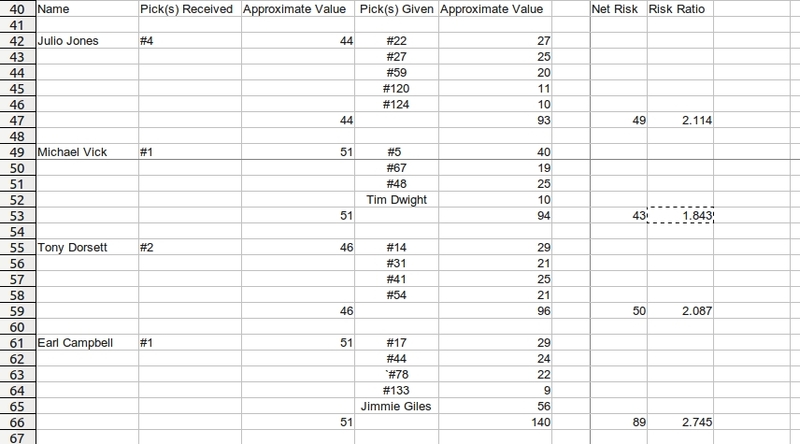 There are a number of ways to analyze a draft trade. You can do it by comparing the actual players selected (though that takes time), you can do it by trade value, as measured by a trade chart, or you can do it by using the Pro Football Reference statistic approximate value. There are charts of approximate value per draft choice and those charts can be used to calculate trade values and risk immediately. The recent blockbuster trade by the Jets involves substantially more risk than the last five major trade ups in the NFL (here, here and here). To make these calculations I assume the Jet’s pick next year will be the 10th pick in the second round, hence the 42nd pick. With a risk ratio of 2.7 2,5, the risk incurred by the Jets is a bit less to what Washington put up with in the RGIII trade. It’s also comparable to the Earl Campbell trade. The last two trades were high risk – never paid back kinds of trades (though with Earl Campbell, the team’s competitiveness during his peak years may have been enough emotionally for the Oilers). Update: recalculated risk, which now stands at 2.5 instead of 2.7. This would have been done earlier, but Pro Football Reference dropped its very handy chart of draft position versus AV. I started missing it more and more, and using the Wayback Machine I found it here. The three major QB trades of 2017 were the trade for Mitch Trubisky, Patrick Mahomes, and Deshaun Watson. We will analyze them in sequence. The Bears have a trade risk comparable to a typical trade for a #1 draft choice and a quarterback at that. The trade has less fundamental risk than Goff or Wentz. The comparable that comes to mind is Eli Manning. By contrast, the delta AV of the other two trades are substantially less. Mahomes merely has to give six seven good years, and the trade ends up warranted. The issue in the case of Deshaun Watson is keeping him upright. A fistful of whole years almost as good as his freshman year in the NFL and he would end up bordering on Hall of Fame numbers. So here is wishing Deshaun Watson a healthy career from now on. The AV cost of the 2016 Eagles-Browns trade. I didn’t expect another trade of this magnitude, and so quickly. But let’s crunch the numbers on this trade, and compare them to the 2016 Titans-Rams trade. The Browns received from the Eagles, the #8, #77 and #100 picks in this draft. In 2017 they receive the Eagles first round pick. In 2018 they receive the Eagles 2nd round pick. The Eagles have received the #2 pick in this draft, and the Browns 4th round pick in 2017. For the purposes of this calculation, we assume the Eagles will pick 20th in 2017 and 2018, and that the Brown in 2017 will rise from 2nd to 10th. The AV costs of the 2016 Eagles Browns trade. The Delta AV for both trades are the same, but since the Eagles received a lot less AV, the relative ratio of AV given to AV received is higher. The trade cost is the same, but the purchase is more highly leveraged. There were, of course, two substantial trades of Ricky Williams. The first netted the Washington Redskins the whole of the Saints 1999 draft, plus the Saint’s first and third round picks of 2000. Three years later, Ricky was traded to the Miami Dolphins for a pair of first rounders, plus change. The first was obviously not paid off. How did the Miami Dolphins fare in their trade, using our new risk metrics? Risk Ratio no longer makes sense as a term when you’re talking about someone already drafted. The important term becomes the net risk term, 52 AV. That’s 1 more AV than the typical #1 draft choice, and that’s the amount of AV Ricky had to generate in order for this trade to break even. 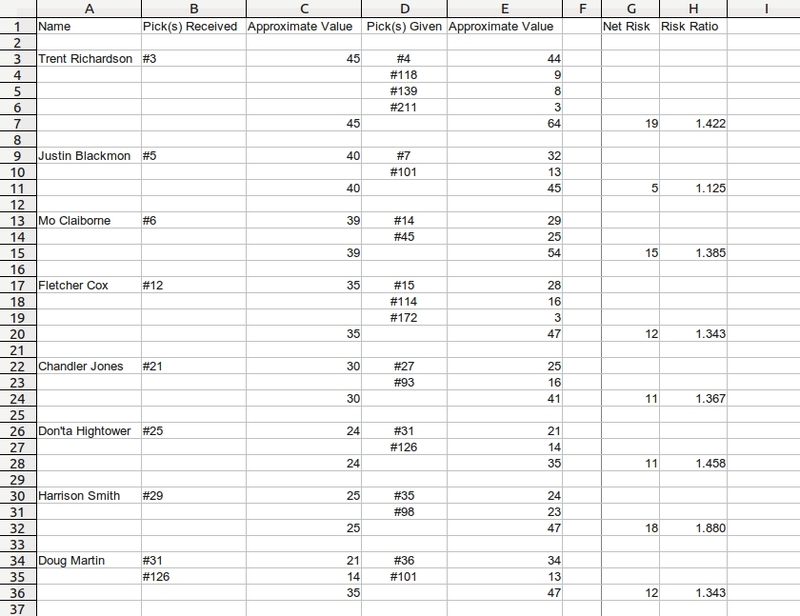 And note, these calculations are derived from weighted career AV, not raw AV. So any raw AV we apply to these numbers is a rough approximation (A typical career summing to, say, 95 AV, might end up around 76 or so WCAV). That said, Ricky Williams had a great first season with the Dolphins, generating 19 AV in that season alone. His total ended up somewhere around 57 AV. I’d suggest the second trade approximately broke even. I wrote a book about decision making in the NFL. It’s sort of a pop science book because it seeks to make what happens in the NFL understandable via some work that people like David Romer, Richard Thaler, and Daniel Kahneman have done. But because all pop science books make their point through narrative, I spend a lot of time looking at why football coaches are so old, but other game players like chess players and poker players are so young (Tom Coughlin is 65 and yet the #1 ranked chess player in the world is 21, the world’s best poker players are 25-ish). The link for the book is here, if this topic sounds interesting to you. I’ll only note in passing that while physics prodigies are common, biologists seem to hit their stride in their 60s. Some areas of knowledge do not easily lend themselves to the teen aged super genius.